Hurst revealed Monday that he's finally back at full strength after having a screw removed from his foot, Jonas Shaffer of The Baltimore Sun reports. Hurst caught 13 of 23 targets for 163 yards and a touchdown as a rookie in 2018. Hurst hauled in one of his two targets for an 18-yard reception during Saturday's 22-10 win over the Chargers. Analysis: The rookie first-round pick has gotten lost at times in a crowded tight-end group, but he's now managed a reception in back-to-back games for just the second time this season. That's not exactly a significant accomplishment, however, making Hurst a rather unappealing fantasy entity at this stage of his career. He's unlikely to deliver a useful performance in the regular-season finale against the Browns while splitting snaps with the likes of Mark Andrews, Nick Boyle and Maxx Williams. Hurst caught all three of his targets for 20 yards against the Buccaneers. Analysis: The rookie has been largely invisible from the passing game in recent weeks, and prior to Sunday, Hurst had been held without a target in three of his last four games. Hurst averages just 6.0 YPT and is 10th on the team in targets for a run-heavy offense. He will face the Chargers in Week 16. Hurst caught three of four targets for 25 yards against the Raiders. Analysis: The rookie was third on the team in targets, but Baltimore went to the air just 25 times in the contest. Still, it was encouraging to see Hurst's increased involvement after he played 35 snaps and saw zero targets in Week 11 against Cincinnati. Baltimore does seem to be moving to a more run-heavy attack while Joe Flacco is sidelined, so target volume may be hard to come by for Hurst. Hurst caught one of two targets for 21 yards in a 23-16 loss to the Steelers on Sunday. Analysis: After catching his first career touchdown in garbage time the previous week, Hurst was outshined Sunday by fellow tight end Mark Andrews, who caught three of six targets for 50 yards. The two rookies are stuck in a timeshare alongside veteran blocking specialist Nick Boyle, with Andrews the preferred option on obvious passing downs. Hurst has caught just four of 10 targets through the first five games of his career as he enters a Week 10 bye. Hurst caught two of three targets for 29 yards and a touchdown during Sunday's 36-21 loss to Carolina. Hurst was unable to haul in either of his targets during Sunday's 24-23 loss to the Saints. Analysis: Through three active games, Hurst has been able to catch just one of his five targets for seven yards -- not exactly what Baltimore was hoping for out of its first-round pick. The Ravens' tight-end room is crowded, and fellow rookie Mark Andrews and veteran Nick Boyle have apparently emerged as the primary contributors. Until that changes, Hurst shouldn't be on your radar -- even with a matchup against a so-so Panthers pass defense Sunday. Hurst did not haul in his lone target and did not gain any yardage on his lone carry during Sunday's 21-0 win over the Titans. Analysis: Hurst still has some work to do to work his way into a deep tight-end room after missing the first few weeks of the season with a foot injury. Sunday's matchup against the Saints' 30th-ranked pass defense looks promising for the rookie pass catcher, but it'd be difficult to place much faith in him until he proves himself a bit. Hurst is turning in a strong week of practice and could have an increased role Sunday against the Titans, Clifton Brown of the team's official site reports. Hurst made it through Sunday's 12-9 loss to the Browns without any setbacks, Jeff Zrebiec of The Athletic reports. Hurst (foot) is listed as active for Sunday's game against the Browns. Analysis: With Adam Schefter of ESPN previously reporting that Hurst could start in his NFL debut Sunday, it's clear that the Ravens have plans for the No. 25 overall pick in April's draft. That said, in his first game as a pro, the 25-year-old tight end still could share work with Nick Boyle, Mark Andrews and Maxx Williams, so he's a speculative fantasy play in Week 5. Hurst (foot) is expected to make his NFL debut Sunday against Cleveland, Adam Schefter of ESPN reports. The Ravens and Browns will kick off at 1:00 p.m. EDT. Analysis: Hurst, who was a limited practice participant all week, not only will make his debut but per a source will start against the Browns, who rank 20th in yards per game allowed to tight ends. The Ravens have used a trio of players at tight end, all of whom have combined for 31 catches, 342 yards and a touchdown through four games, so they have the luxury of bringing Hurst along at a measured pace. Hurst (foot) is listed as questionable for Sunday's game against the Browns. Hurst (foot) was limited at practice Wednesday. Analysis: Coach John Harbaugh relayed that Hurst was nearly able to play in Week 4, so barring any setbacks, there's a solid chance the first-round pick will make his NFL debut Sunday against the Browns. 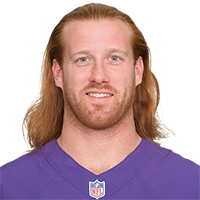 In such a scenario, he'll join a crowded tight-end corps that also includes Nick Boyle, Mark Andrews and Maxx Williams. Hurst has some long-term upside, but he would probably need to turn in a full and productive game before he becomes worth grabbing off the waiver wire. Coach John Harbaugh said Hurst (foot) was nearly able to play in Sunday's 26-14 win over the Steelers, Jamison Hensley of ESPN.com reports. Hurst (foot) is inactive for Sunday's game against Pittsburgh, Jamison Hensley of ESPN.com reports. Analysis: Hurst is nearing a return, but he'll now aim for a season debut in Week 5. Mark Andrews, Nick Boyle and Maxx Williams will thus handle the Ravens' tight end duties Sunday. Hurst (foot) is listed as questionable for Sunday's game in Pittsburgh. Hurst (foot) is hoping to play Sunday against the Steelers, Ryan Mink of the team's official website reports. "I think I'm good to go. It's up to the trainers and what they think is right for me," Hurst said Thursday. 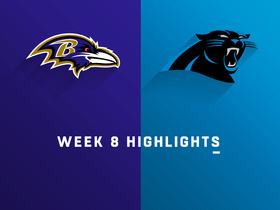 Hurst (foot) said he considers himself day-to-day in advance of the Ravens' Week 4 game against the Steelers, Jamison Hensley of ESPN.com reports. "It's a little sore," Hurst said Thursday of his surgically repaired foot. "But four weeks removed from surgery, I'm excited about my progress." Hurst (foot) returned to practice Wednesday and moved around well, Jamison Hensley of ESPN.com reports. Coach John Harbaugh said Hurst (foot) could return to practice this week. Hurst (foot) has been ruled out for Sunday's game against Denver, Jeff Zrebiec of The Athletic reports. Analysis: Hurst's recovery timeline was estimated at 3-to-4 weeks when he was diagnosed with a stress fracture in his foot Aug. 24. It seems his rehab process will stretch well beyond the initial timetable, as he still hasn't returned to practice nearly a month later. Nick Boyle, Mark Andrews and Maxx Williams will continue to form a timeshare at tight end. Coach John Harbaugh said Hurst (foot) isn't expected to take part in practice this week. Analysis: When he was diagnosed with a stress fracture in his foot on Aug. 24, Hurst was in line for a 3-4 week recovery, but he's already brushing up against the latter end of that timetable. The 2018 first-round pick is thus a better bet to make his pro debut Week 4 (or later) rather than Week 3. Look for the trio of Nick Boyle, Mark Andrews and Maxx Williams to continue holding down the fort at tight end for the Ravens. Hurst (foot) has been ruled out for Thursday's game in Cincinnati, Jeff Zrebiec of The Athletic reports. Analysis: Hurst was always expected to miss at least two games after having surgery Aug. 24 to address a stress fracture in his foot. He's likely targeting a return in Week 3 or 4, at which point he would enter a timeshare at tight end. Nick Boyle, Maxx Williams and Mark Andrews had three receptions apiece in Sunday's 47-3 win over the Bills. Hurst (foot) was a non-participant in Tuesday's practice. Analysis: Hurst doesn't have a real shot to play against the Bengals on Thursday Night Football, given that he'll need at least another week to recover from the minor procedure he underwent in the offseason. The first-round rookie should be working toward a regular-season debut in Week 3 or Week 4. Mark Andrews and Maxx Williams both showed well in Hurst's absence in the season opener, so Hurst could see competition for snaps when he does return. Hurst (foot) is out for Sunday's game against the Bills. Hurst has a stress fracture in his foot and likely will be out for 3-to-4 weeks, Mike Garafolo of NFL Network reports. Hurst caught his only target for a 12-yard gain in Thursday's preseason game against the Rams. Hurst caught three of four targets for 14 yards and a touchdown during Thursday's Hall of Fame game against the Bears. Analysis: Hurst looked to have missed a few blocks during his preseason debut, but he more than made up for it with solid route running and soft hands. The highlight of the rookie's night was on a seven-yard scoring strike from fellow first-rounder Lamar Jackson, something Ravens fans hope to be seeing plenty of in the future. Hurst will next take the field in Baltimore's second preseason game next Thursday against the Rams. Hurst (undisclosed) returned to practice Tuesday, Jamison Hensley of ESPN.com reports. Head coach John Harbaugh said Hurst didn't practice Friday due to a minor soft-tissue injury. Analysis: The location of Hurst's injury isn't clear. Regardless, the tight end isn't considered to be dealing with anything serious, and it may not be long until he's back in action. When healthy, Hurst will compete with Nick Boyle and fellow rookie Mark Andrews for slotting atop the depth chart. Hurst, the 25th overall pick in the 2018 NFL Draft, is signing a four-year contract with the Ravens, Ian Rapoport of NFL Network reports. 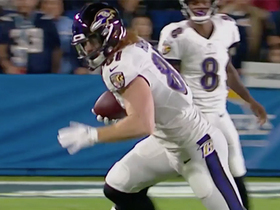 Baltimore Ravens tight end Hayden Hurst makes a shoestring catch to gain a first down and 18 yards on a pass from his quarterback Lamar Jackson. 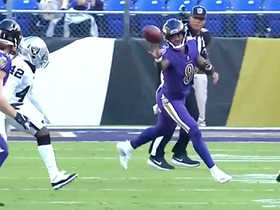 Baltimore Ravens rookie quarterback Lamar Jackson makes Favre-esque flip to tight end Hayden Hurst for a first down. 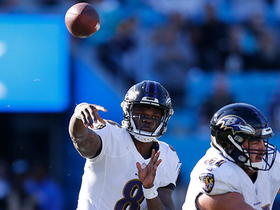 Baltimore Ravens quarterback Lamar Jackson finds tight end Hayden Hurst on a 22-yard touchdown completion. 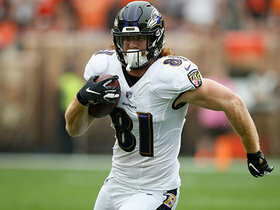 Baltimore Ravens quarterback Joe Flacco connects with tight end Hayden Hurst for a 7-yard completion.